The Legend of the House on the Left at the End of the Lane in Nightmare Park. There are times in which I believe that I don’t understand humor. Watching Jim Carrey and Adam Sandler rise to fame, I nearly became convinced that I didn’t. I do enjoy comedies, but I tend not to risk watching them unless I’ve heard good things from people I trust. A bad action or horror film can be fun in their own ways, but I find bad comedies excruciating. Being funny is the whole point, so when I can’t laugh with one I can’t enjoy it at all. To be honest, there are two exceptions to that general rule, and both are due to my affection for the soundtracks. The scores by The Kinks and Herb Alpert & the Tijuana Brass make the movies Percy and Casino Royale , respectively, worthwhile for me. For the “old, dark house” spoof The House in Nightmare Park I clung desperately to my adoration of Ray Milland, and that mostly saw me through. 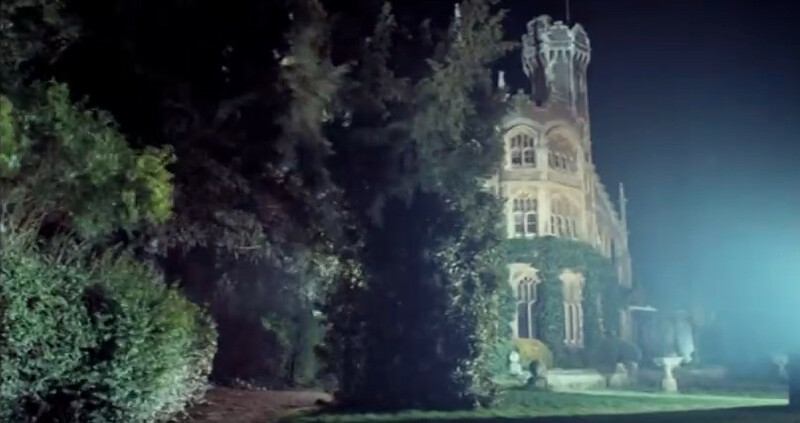 The film is set at an English estate, at the beginning of the 20th century. Foster Twelvetrees (Frankie Howerd) is an oafish orator, eking out a living by dramatizing stories and poems for bored audiences. Having made appearances in a handful of the Carry On… films, it’s a position with which Howerd is likely familiar. Twelvetrees is invited to the house by Stewart Henderson (Ray Milland) to perform for the Henderson family. The family consists of the mysteriously ill eldest brother, Victor; sister Jessica (Rosalie Crutchley); brother Reggie (Hugh Burden) and his daughter, Verity; brother Ernest (Kenneth Griffith) and his wife, Agnes; and the matriarch, who is kept locked in a room. Also present is the lone servant, Patel. The Henderson siblings were raised in India, where they toured as living marionettes. This has little to do with anything, but allows for “othering” of the family to make them allegedly creepy. They worship the Hindu goddess Kali, which makes for some violent iconography in the set, and for reasons never explored they keep dangerous snakes in a display beneath the house. It’s a lovely setting for a few days of close-knit, family slaughter. Being a parody of these sorts of stabby situations, there is of course a troublesome will. There’s also the matter of Victor’s stolen diamonds, rumored to be worth a million pounds. Last of all, there’s the matter of the five guineas promised to Twelvetrees for providing the non-lethal entertainment. Since humor plays with expectations, the somewhat standard plot motivators are a good baseline, with the minor amount of the performance fee as a funny MacGuffin in comparison. That sort of comedy — undercut expectations and understated ironies (like reading Dickens’ A Christmas Carol to Hindus) — works well in the film, and the script supplies a decent amount of it. Mr. Henderson, in the parlor, with an oaf. Where it doesn’t succeed as well is with the dusty dancehall jokes that were a staple of British comedy at the time. A droll example: Twelvetrees sees Jessica holding two rabbits and says “Look at them. What a lovely pair! May I stroke them?” Hyuck, hyuck, snore. Here, the audience lucks into a bit of a reprieve. This sort of joke isn’t infrequent, but it’s also not constant, so it’s only a minor annoyance. Howerd actually manages a form of restrained buffoonery, which allows him to play it all off as awkward nervousness rather than knowing lewdness. I’m in an awkward position myself of having to admit that I largely enjoyed his performance. Of course, I only watched this in the first place because of my unreasoning adoration for Ray Milland, an actor who made dozens of crap movies better for being in them. His character Stewart is the principal schemer in the treacherous Henderson clan. Here, he gets to be by turns darkly charming and cartoonishly evil, with fraying patience and strident authority. It’s a solid performance if not a particularly challenging one. 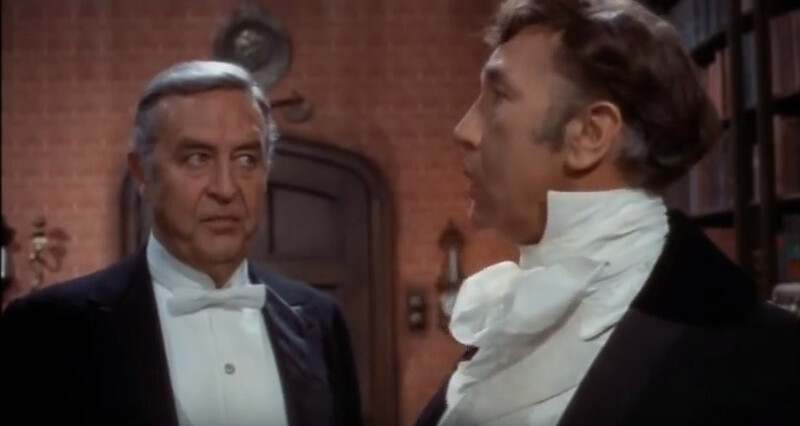 What I like about it is that Milland is only seconds away from his final transformation into the character actor who plays cranky and petulant, but he still has a glimmer of the mannered sociopath of Dial ‘M’ for Murder about him. It’s an interesting look at an actor on the cusp of his umpteenth phase. 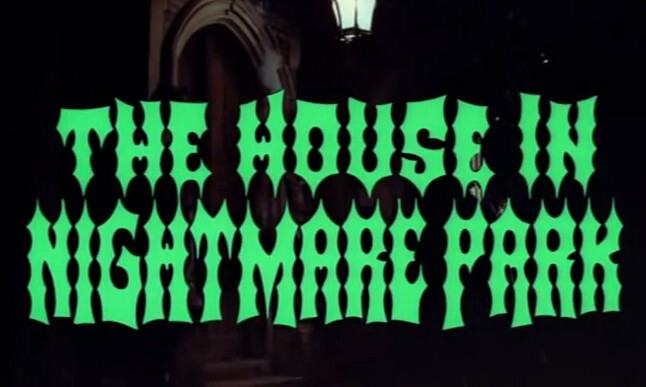 The House in Nightmare Park is hardly a must-see, but it is good fun. In a way, it’s a precursor to films like Evil Dead 2 , which are horror films with comedy rather than comedies with the trappings of horror. Other movies at the time were moving in that direction — think The Abominable Dr. Phibes — a long cry from the Abbott and Costello days, where the jokes where the main point. The pairing of writers Clive Exton and Terry Nation made for a good mix. Nation, of course, was the legendary BBC script-writer who worked on beloved shows like Doctor Who (he created the Daleks) and created Blakes 7 . Exton had less of a cult impact (unless you count co-writing Red Sonja ), but in his 6-decade career he contributed scripts to Agatha Christie’s Poirot and Jeeves and Wooster . What I’m getting at is that they brought some experience to the table, and it shows. A lovely pair, indeed.